A very senior artist who performed in Radio, TV and films of Pashto, Urdu and Punjabi. He proved to be a very impressive villain in Pashto films and played very memorable roles. Being son of very senior artist of silent era, he performed very matured acting in all mediums. Umar Daraz started his acting career from the state-run Pakistan Television in 1968. He started his film career from famous movie Dara -e- Khyber in 1970 and acted in hundreds of Pashto films and mostly played the role of a villain in the movies. Umar Daraz Khalil was son of renowned actor of Sub-continent Master Khalil who as actor performed in many silent films. Master Khalil who was then known as Khalil Kaka started he career in year 1912. In 1930s he appeared in Hatim Tai Ki Beti, Khatarnak Aurat and Khudai Khidmatgar. 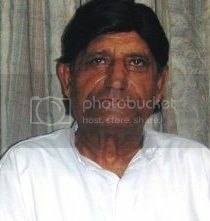 Umar Draz was born in 1948 in Chamkani village. Umar Draz started his film career from a children programme at Radio Pakistan Peshawr in which Begum Nasreen Bukhari the wife of renowned actor Talish also used to perform as Aapa in 1958. Umar Draz aslo appeared in some radio commercials and after getting education up to intermediate level he joined WAPDA department. Ishrat Abbas brother of Umar Draz also is a renowned TV artist from Peshawar TV. In 1970 Pashto film was inaugurated with release of Yousaf Khan Sher Bano which opened a door for Pashto artists so Umar Draz also moved to cinematic world and was able to get chance in second Pashto film of Pakistan Dara -e- Khayber in 1971 and played the role of father of Surreya Khan who is sardar of a tribe. This was a great start and till his demise he kept on appearing in Pashto films and got a good name as villain. With this whenever he was asked he performed in TV as well like he appeared in successful serial of Lahore TV Ainak Wala Jin as Jadugar. Umar Daraz Khalil died at the Lady Reading Hospital, Peshawar, on December 16, 2016 after suffering a brain haemorrhage attack at his residence in Abbottabad a few days ago. He was first taken to the Ayub Medical Hospital and then brought to LRH where he remained in coma for two days. His funeral prayers was offered at the ground of Government College, Peshawar today (Saturday) after which he was buried at his ancestral graveyard in Chamkani. He is survived by a daughter and widow.